EPA Director Scott Pruitt, center, looks out over the Superfund site with Region 6 Acting Director Sam Coleman (straw hat), other EPA officials, and FoxNews26 reporter Greg Groogan (in cap). Pruitt wanted to be more familiar with the site and its potential problems, he said, especially after the recent flood event. 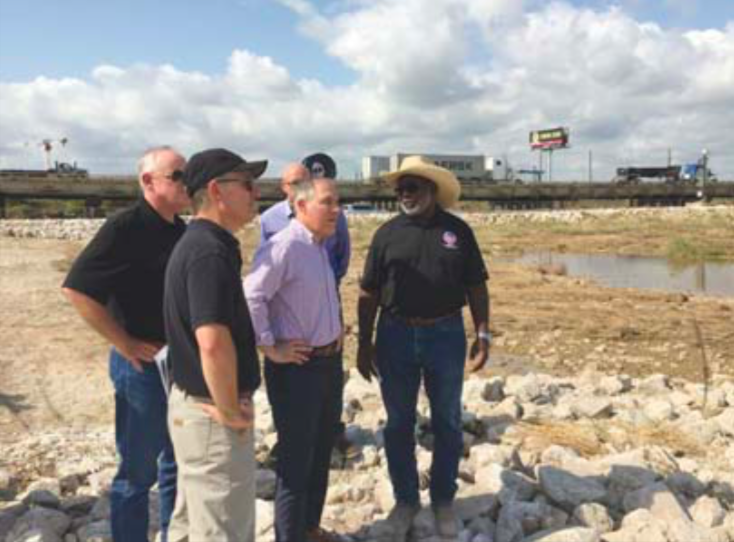 The head of the federal EPA (Environmental Protection Agency) and the person who will have the final say on how the San Jacinto River Waste Pits Superfund Site is disposed of, was in East Harris County last Friday to walk across the site and learn about the conditions firsthand. Accompanying EPA Director Scott Pruitt were officials from the EPA, both nationally and from the Dallas office, including the Region 6 Acting Head Sam Coleman. Also on hand was Fox News 26 reporter Greg Groogan, and after the walk Pruitt had an opportunity to discuss his visit with Jackie Young of THEA (Texas Health and Environmental Alliance) and Scott Jones of GBF (Galveston Bay Foundation). Pruitt’s visit to the site was highly unusual, with EPA officials normally relying on reports and inspections from their staff and consultants. In addition to the personnel accompanying Pruitt, there were also at least two boats with dive teams inspecting and probing the waste pits just beyond Pruitt’s presence. They were searching for breaks in the armored cap and its geotextile membrane after the Hurricane Harvey, and the subsequent flooding by the raging river. Nearby the torrent of the river had washed out two roads, making them impassable, and caused huge sinkholes in a residential area, where houses slid into the holes. From where Pruitt stood, he could also see the damage to two large bumpers in the river that were meant to protect the I-10 bridge, but obviously had been hit and compromised. Pruitt was able to see the 1/3 of the material that is above the waterline, but 2/3 of the toxic waste remain below, with its condition of containment not really known. Days after Pruitt left the site, divers were still in the river probing the cap’s condition below the waterline. After walking the site, and viewing the extent of the problem, Pruitt said he would take quick action, but did not indicate which “permanent solution” he favored. The EPA staff has recommended complete removal of the toxic material, which might mean as many as 17,000 truckloads hauled off the site, a project that will take over a year and cost up to $60 million dollars. However, another group (San Jacinto Citizens Against Polution) has recommended to the EPA that they build a permanent concrete cap, with administrative controls for the next 75 years. CONGRESSMAN GENE GREEN, center, sponsored a FEMA workshop last Saturday September 16 for the North Shore community. The event was held at the Christian Tabernacle, on Wallisville Road. Joining Green in sponsoring the event were local officials seen above, State Representative Ana Hernandez, State Senator Sylvia Garcia, and City Councilman Robert Gallegos. 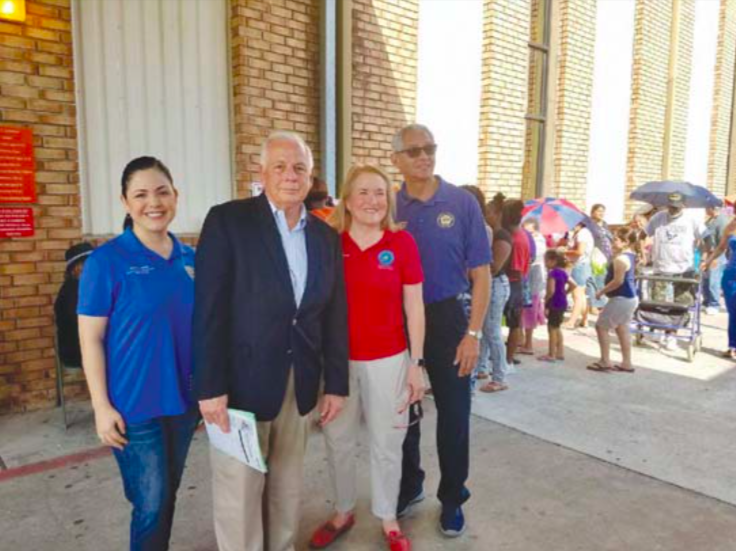 NORTH SHORE – A FEMA workshop and Disaster Relief Assistance event was held last Saturday, September 16, sponsored by Congressman Gene Green. Joining Green in publicizing and sponsoring the workshop were State Representative Ana Hernandez, State Senator Sylvia Garcia, and Houston City Councilman Robert Gallegos. On hand to answer questions, explain the federal assistance programs, and help people sign up for them were representatives of FEMA (Federal Emergency Management Agency) and the SBA (Small Business Administration). The event was held from 10 am to 12 noon at the Christian Tabernacle at 13334 Wallisville Road, near Maxey. MAGELLAN MIDSTREAM has oil storage tanks and pipelines in Galena Park, similar to this view from their website. GALENA PARK – Authorities are investigating a major gasoline spill from two storage tanks in Galena Park, damaged by flood waters from Hurricane Harvey. The tanks belong to Magellan Midstream, in Galena Park. The spill happened on Thursday, August 31 but was just recently reported. The size of the spill, 11,000 barrels or 461,000 gallons, makes this a major environmental problem. However, the company said that they were able to contain the spill almost immediately, and only a small amount leaked into a drainage ditch and on to the Ship Channel. Spokesperson Bruce Heine said that the company covered the spill with firefighting foam to prevent harmful vapors from escaping into the air, and used containment floats to keep the liquid from spreading, and then it was recovered. They are currently excavating contaminated soil and trucking it to an approved landfill. The Magellan terminal is near Hunting Bayou and the Ship Channel in Galena Park. The original estimate of the size of the spill was 1000 barrels, but raised when officials were able to access the area. Harvey floodwaters caused other spills, from ExxonMobil, Valero , KinderMorgan, and Phillips elsewhere in Texas. 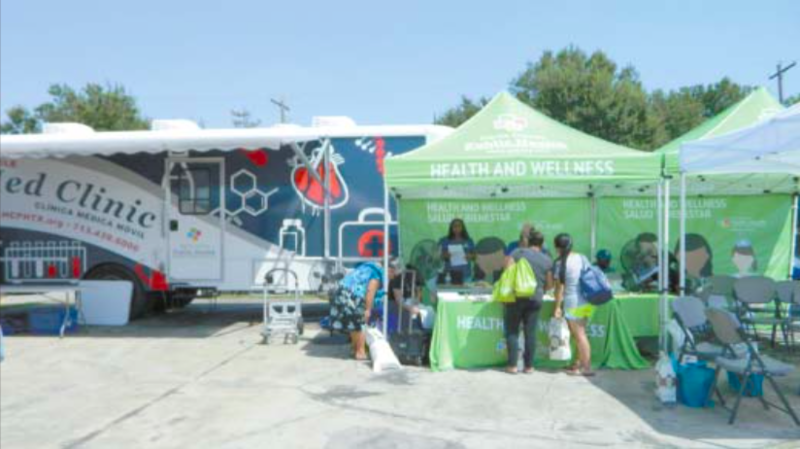 WELLNESS SCREENING AND A MOBILE CLINIC VAN were part of the on-site Public Health Services brought to Galena Park by the Harris County Public Health department. To combat the health problems brought on in neighborhoods flooded by Hurricane Harvey, the Harris County Public Health Department has put together a Mobile Wellness Unit, and dispatched it for a day into neighborhoods with significant flooding. The initiative is known as “Taking Public Health to the Public” and provides much-needed services and supplies directly in the communities devastated by the recent flooding. This week the Mobile Unit was assigned to Kingwood on Monday, and Galena Park on Tuesday. Other sites will be announced later. 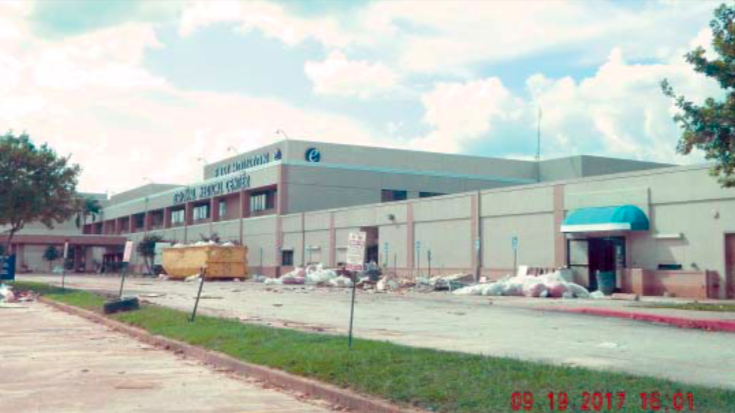 The parking lot of Baggett Center, on Keene Street, was the location of the Wellness Unit serving a large population in surrounding communities as well as Galena Park. In addition, bags of groceries with bulk canned vegetables, hand cleaner, and crackers were also given out as basic subsistence. More photos and information are available on page 8 of this issue. See @hcphtx on Twitter for more scheduled stops. MOSQUITOS were fought by free cans of spray repellant, after you viewed a video of the health dangers of mosquitos and how to avoid them. Several fires and subsequent explosions sent black smoke and fumes into the sky near Crosby. CROSBY – Seven first responders and as many as 20 homeowners have filed suit over fumes from the Arkema plant explosions on Sept. 7. The suits allege gross negligence and demand at least $1 million in damages in Harris County District Court. Fifteen Harris County deputies and eight ambulance crews including the Medical Service Director were hospitalized on Sept. 3 after the last of refrigerated trailers exploded at the Arkema plant. Reports indicate that ambulance personnel flung themselves onto their own ambulance gurneys and deputies vomited on the spot but most refused to be taken by ambulance to the hospitals because they would not vacate their vehicles due to munitions aboard their patrol units and elected to drive themselves to the hospitals. Deputies and EMS personnel stand ready on US90 the night of September 7th, outside the 1-1/2 mile safe zone. The suit alleges that Arkema had days of warning to be prepared for the disaster. It was over 500,000 gallons or organic peroxides within the nine refrigeration trailers that without the refrigeration capacity were expected to explode said the company. On August 31, the first of a series of explosions of the trailers dispersed throughout the plant’s property went off. 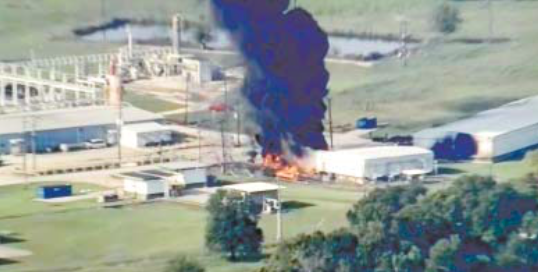 Although the Harris County Office of Emergency Management and Homeland Security insisted there were no concentrated ammonia compounds on the site, worry continued for most people in surrounding communities over air quality and the nature and size of explosions. The Harris County Community Services Department of Transit Services will be implementing FREE shuttle bus route services for flood victims from Jim Fonteno Annex to FEMA Disaster Recovery Center located at the Baytown Community Center. Shuttle bus service will begin on Thursday, September 14, 2017 through Wednesday, September 20, 2017, except Sunday. Shuttle bus route will run every hour starting from the Jim Fonteno Annex at 9:00 a.m. to 7:00 p.m. with the final trip being from the FEMA Disaster Recovery Center at 7:00 p.m. Areas provided but not limited to, are North Shore/North Channel Area, Channelview, Galena Park, Jacinto City and Cloverleaf.